Admit it, you have fantasized about the zombie apocalypse. Don’t be ashamed, I think everyone reading has their strategy planned and if you don’t… well, you’ll be one of the first to go. And for those of you who don’t think that it can (or will) happen, I have some sorry news. It looks like the government is looking for ways to “freeze” all bodily functions including heart beat and brain activity and then reanimate the corpse. The military’s Darpa team has given 9.9 million to the Texas A&M Institute to study ways to extend the time in which a dead or dying soldier can be brought back to life. Of course, the uses only begin with the military. I don’t think this kind of “medicine” is a bad idea. I think it’s a great idea if we can develop a way to stop a soldier, and eventually, civilian from dying in order to get them treatment. I only bring this to your attention as further proof that a mistake could eventually be made. I mean, you have seen 28 Days Later, right? Want the full story? 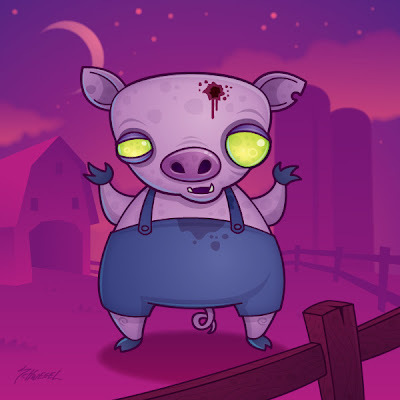 Head over to Wired.com to read about the zombie pigs. For more evidence that the zombie apocalypse could happen, check out some previous posts.